Amoudi bay, is famous for the traditional Greek taverns with fresh fish and the amazing romantic sunsets. Once the commercial port of Santorini, today this tiny bay, located right below the village of Oia, is a favorite spot for the tourists. There may not be sunbathing comforts but diving from the small beach with the red and black rocks, or even better - from 6 meters high from the beautiful islet with the chapel of Agios Nikolaos, and swimming below the Caldera, is an experience that the ambitious swimmers will not forget. Armeni bay, is the second small port of Oia, which in 19th century was used for commercial purposes - to load ships and wine for export. Today it is not that popular among the tourists despite the peacefulness and the breathtaking views that it offers. Katharos beach is located to the west of Oia village,only 1 km. far. To get there, go towards Ammoudi until you reach the sign-post for Katharos. Turn right there and after about 100 meters you’ll reach a parking area. From there, continue on foot for about 2 min walk downhill, following the path that leads you onto the beach.Black pebbles and big sharp rocks dominate the landscape and create a wild beauty. The rocks also offer some shade if you are there in the morning hours. On a windless day it could be the perfect place to visit and spend some relaxing time. The beach of Baxedes, located in northern Santorini, is a lovely coarse sandy beach with crystal-clear waters and shade provided by the trees located on the beach. 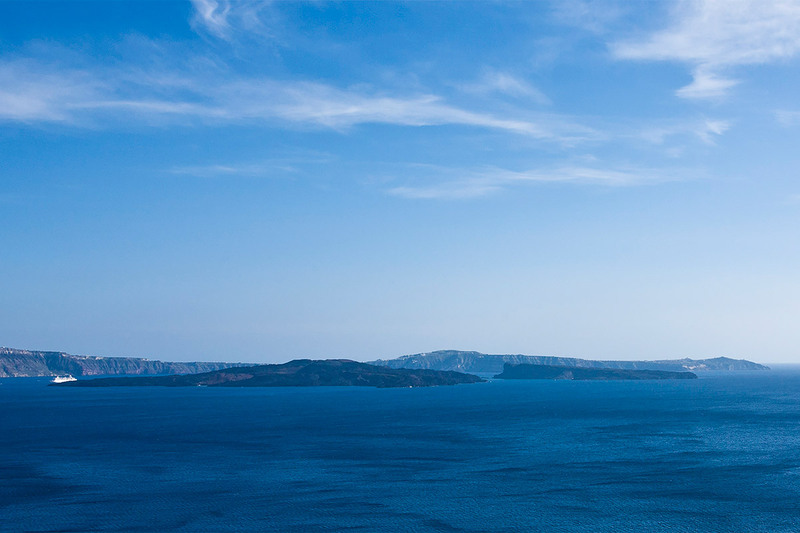 It is the ideal place for those who wish to stay away from the more frequented beaches of Santorini. Baxedes is surrounded by many beaches such as Paradise or Gia sas. Due to its location the beach is affected by the summer northern winds (meltemia) and it is not the best choise when the north wind is blowing. Kouloumbos beach, From the beaches at the North East part of Santorini Kouloumbo (or Columbo) is the greatest.It is a long sandy beach of unique beauty nestled next to a cliff and the last one in Santorini that is not organised at all (no beachchairs and umbrellas). An option for the visitors that want to avoid the big crowds and don't care about the extra luxury of sunbeds and umbrellas. Since there is nothing on the beach (except sand and the sea of course) it is very wise to bring at least one big bottle of water and some sunscreen if you don't want to return home feeling dehydrated and looking red as a lobster. East of the beach at a distance of 3 miles and underwater at a depth of 18,5 meters is located the omonymous crater of the volcano that gave the 1650 eruption and caused several disasters on the island. Agios Nikolaos (castle), In the Middle Ages, Oia was one of the 'Kastelia' of the island. It was called 'Kasteli' of Agios Nikolaos. The castle's existence was already documented in 1480. Oia suffered harshly in the earthquake of 1956 and much of the traditional settlement tumbled into the sea below the caldera. Resplendent sanctuaries such as the church of Agios Georgios and Panagia of Platsanis were completely destroyed.Nowadays the site of the Kasteli in Oia is a favourite spot for sunset watching. Naval Maritime Museum, an 19th century mansion has been restored and converted into a museum that houses the Maritime History of Thira. Finikia, It is a small, beautiful traditional village with 50 permanent residents with an impressive entrance which, is a high arched gateway made of dark volcanic stones. Thirasia is an island in the volcanic island group of Santorini in the Greek Cyclades. It lies north-west of Nea Kameni, a small island formed in recent centuries by volcanic activity and thus marking the centre of the island group. Therasia is the second largest island of the group, the largest by far being Thera. Thera and Therasia were separated by the Thera eruption. Church of Panagia Platsani, Religion on the island of Santorini has included both the Greek Orthodox and Roman Catholic followers. 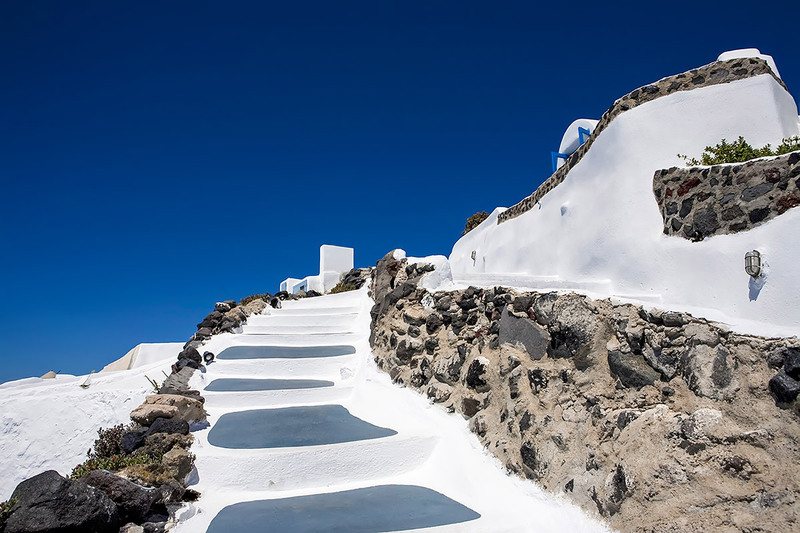 Today Oia, as an Orthodox village, has the picturesque blue domed chapels, pristine white bell towers and volcanic stone trimmed church doorways dotted all along the caldera cliffs. Each chapel is of course named after the Saint it honors and was built by a local family, many to pray for the safe return of the seafaring members of the family. These are closed to the public except on the Saint's Name Day when the owning family sponsors a small celebration complete with wine and local specialties. It's a fine reason for a social event attended by the locals and invited island visitors.